Time to bake your puff pastry. Preheat oven to temperature specified on the box. 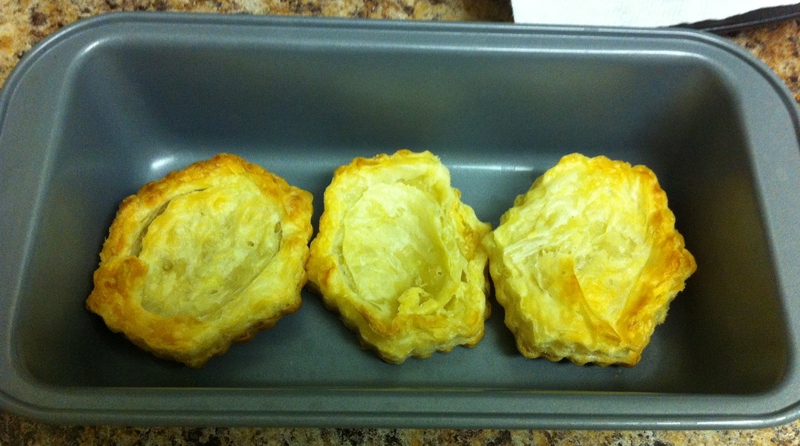 Follow directions on box to bake your puff pastry. Cook time was about 20 minutes for me. 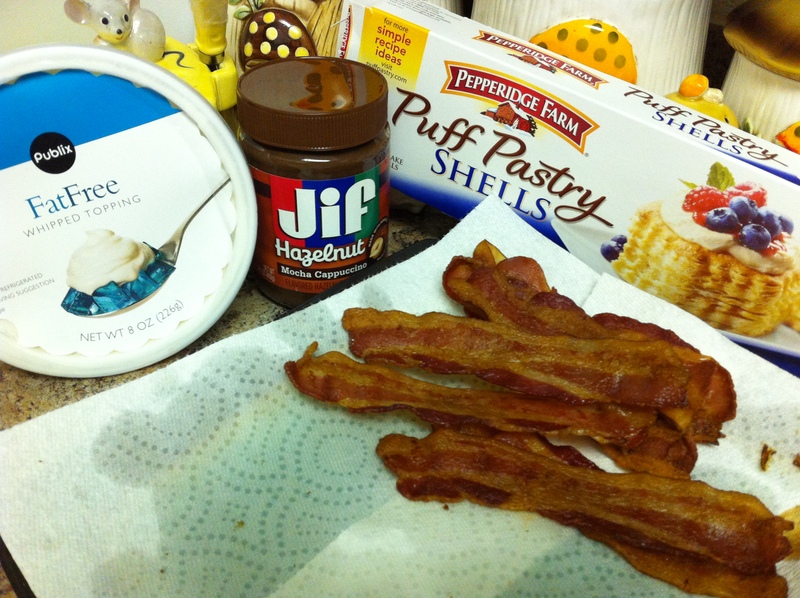 While your pastry cooks, it’s time to mix your whipped topping and Jif spread. 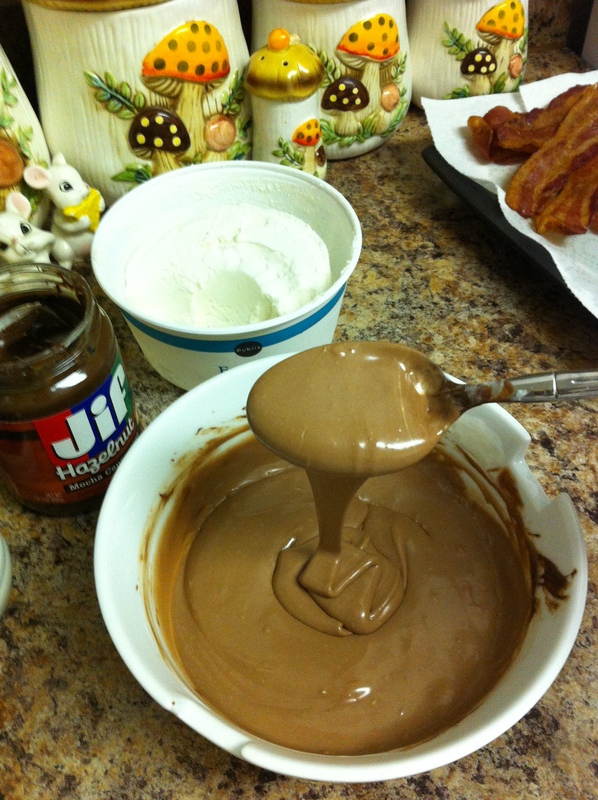 Start with a couple tablespoons whipped topping to one spoonful of Jif spread. As you begin to mix it, you will eventually find it easier to mix and can use a whisk. 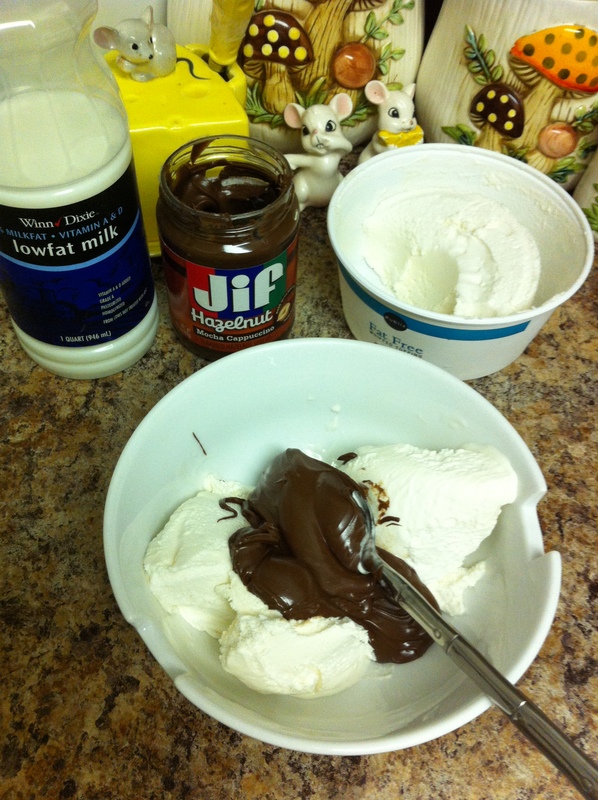 Keep adding both ingredients until the full amount of whipped topping and Jif spread are blended together. ** NOTE: I found it to be easier to let the whipped topping thaw a bit but not let it completely melt. You can also use a very small amount of milk to help speed up the start of mixing. Set aside. Place in refrigerator if your pastry is not ready yet. Your pastry should be ready now. Remove your whipped mixture from the refrigerator if needed. Let thaw for a couple minutes and whisk if needed. It’s pretty basic. 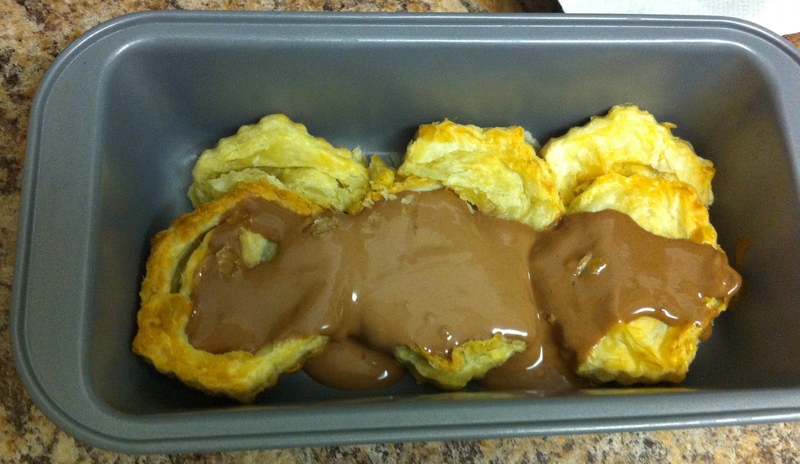 Using a loaf pan, place pastry on the bottom. You may break up the pastry if needed (if you use the “shells”). Now, 1/3 of your whipped mixture. Dispense evenly over pastry. Time for the bacon slices. And top off with remaining whipped topping. I made this the day before an event, so I covered and stored in the refrigerator until the next day. When we were almost ready to enjoy, I simply let sit out for about 15 minutes before serving. * You have many opportunities to make adjustments to this recipe. 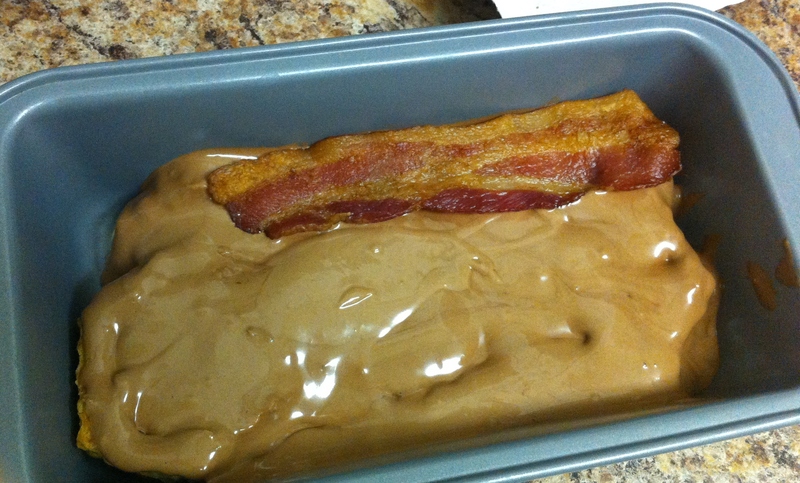 You can chose to use any flavor of bacon, different pastry, or different spread, and even add ingredients like nuts. * As I noted above, I think this recipe would be better with the pastry “sheets” vs the “shells”. 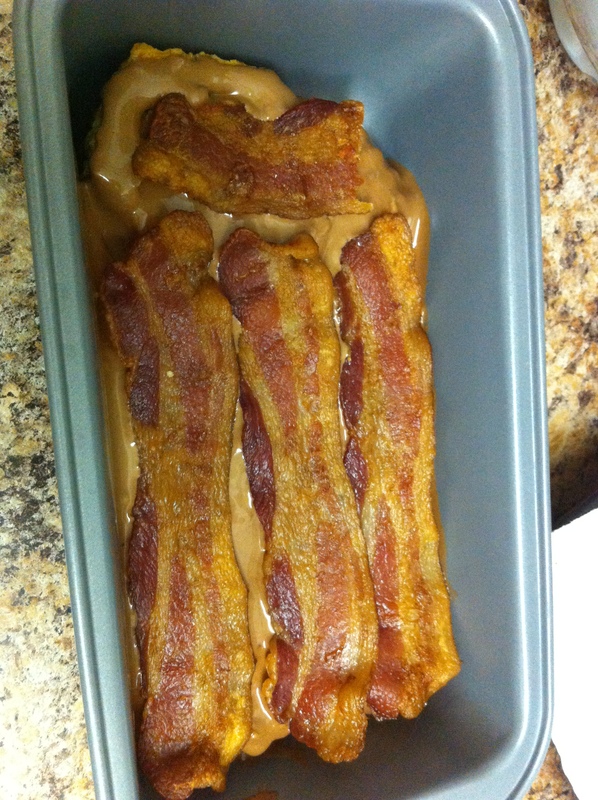 Posted on September 8, 2013, in Cooking with Bacon and tagged Dessert, Jif, Pepperidge Farm, recipes. Bookmark the permalink. Leave a comment.